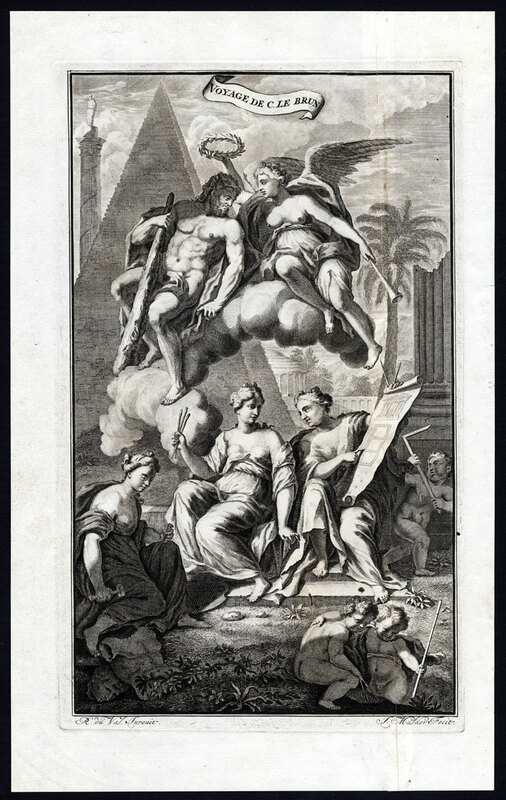 Subject: Title engraving: 'Voyage de C. Le Brun.' This plate shows muses of the arts, putti, Hercules and and angel set is an ancient world landscape with temples, columns and a pyramid. Condition: Fair. This page was cut from top to bottom at richt side of imaga and re-pasted, backed. A few tiny worm holes. General age related toning and light thumbing. Please study scan carefully. Medium: Copperplate engraving on a verge type hand laid paper, with watermark. Size (in cm): The overall size is ca. 22 x 35.5 cm. The image size is ca. 17.5 x 30 cm. Size (in inch): The overall size is ca. 8.7 x 14 inch. The image size is ca. 6.9 x 11.8 inch. Description: This scarse plate originates from: 'Voyage au Levant c'est a dire dans les principaux endroits de l'Asie Mineure dans les Isles de Chio, de Rhodes, de Chypre &c., de meme que dans les plus considerables villes d'Egypte, de Syrie, et de la Terre Sainteï¿½', by Corneille le Brun (Cornelis de Bruyn), published by Henri de Kroonevelt, Delft, 1700. First edition in French, first published in Dutch in1698 ('Reizen...door de vermaardste Deelen van Klein Asia....') In 1702 an English edition appeared as well. Artists and Engravers: Cornelis de Bruijn (also spelled Cornelius de Bruyn, pronounced (1652 ï¿½ 1726/7) was a Dutch artist and traveler. He made two large tours and published illustrated books with his observations of people, buildings, plants and animals. Best known as a landscape artist, Le Bruyn travelled widely from a young age to Vienna, on to Rome then to Smyrna, Constantinople, Egypt, Jerusalem, Syria, Lebanon, and Turkey. Everywhere he went Le Bruyn depicted the scenes around him, he was especially interested in places of antiquity or historic interest, and his are the first images of the interior of a pyramid and Jerusalem to be widely available to Westerners. After an eight-year stay in Venice, Le Bruyn returned to The Hague in 1693 to publish this first book. From 1701 he started a second journey into Russia, Persia... This plate engraved by J. Mulder after R. du Val.